A New Shepard suborbital vehicle, built by the commercial spaceflight company Blue Origin, ascends skyward. The company will attempt to launch and land the same vehicle for a fourth consecutive time this Sunday (June 19). The commercial spaceflight company Blue Origin will attempt to launch a New Shepard vehicle for the fourth consecutive time this Sunday (June 19), and the event will be webcast live, a first for the typically secretive company. The reusable New Shepard suborbital vehicle is scheduled to lift off at about 10:15 a.m. EDT (1415 GMT) from the company's testing range in west Texas, according to a statement from Jeff Bezos, the company's founder and CEO. Bezos had previously stated on Twitter that the launch would take place today (June 17), but it was delayed so the company could replace a faulty O-ring on the launch vehicle. The webcast of the launch will begin at 9:45 a.m. EDT (1345 GMT) on the company's website. This will be the first time Blue Origin has live broadcast one of its launches. The New Shepard vehicle consists of a capsule for passengers or cargo, and a reusable rocket booster. The company has successfully launched and landed this same rocket hardware three times since November 2015. In the statement, Bezos said this Sunday's flight would be used to test a scenario in which one of the capsule's landing parachutes fails. "On this flight, we'll intentionally fail one string of parachutes on the capsule," wrote Bezos, who is also founder and CEO of Amazon.com. "There are three strings of chutes, and two of the three should still deploy nominally and, along with our retrothrust system, safely land the capsule. [It] works on paper, and this test is designed to validate that. We'll also use this flight to continue pushing the envelope on the booster. "As always, this is a development test flight, and anything can happen," he added. The New Shepard capsule is designed to carry humans and other payloads (such as science experiments) on short trips into suborbital space. 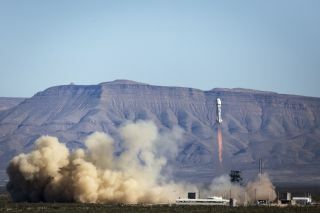 Bezos and other advocates of the technology have emphasized the importance of reusable vehicles in driving down the cost of spaceflight. Blue Origin is also working on an orbital rocket but has not yet entered the test phase with that design. Blue Origin has not yet said when it will move out of the test phase with New Shepard and start flying commercial payloads, or even passengers.